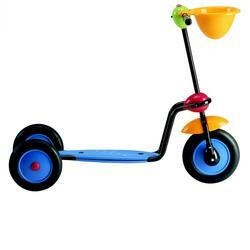 Unique and innovative, the ABC Scooter uses primary colors and streamline design to appeal to smaller children. Its molded, tubular construction provides the durability of its fine Italian craftsmanship. The front storage basket lets children bring toys and other fun objects along for the ride!